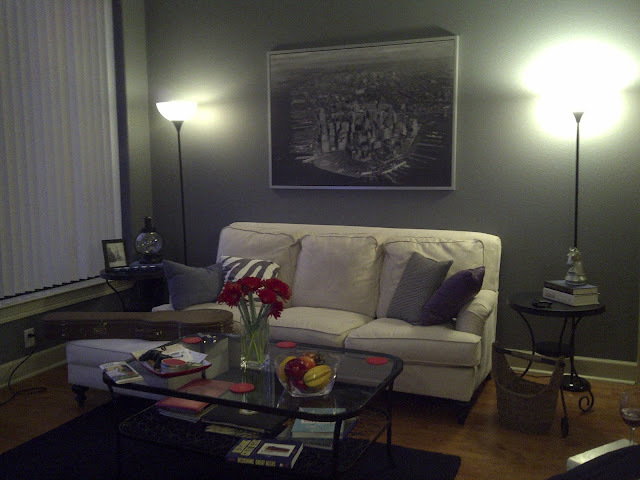 Buckhead Betty ... on a Budget: Brand New Living Room! Yep, my bright, sunny yellow wall. A welcome respite from the beige that preceded it, this wall represented all that was "me" when I realized I owned this here condo and could paint things whatever. the. heck. I. wanted! But then I got tired of it. It lacked sophistication. It lacked style. And ultimately? It was hard to match against with anything other than black and white. Sure, my houndstooth chair and white sofa were fine with it, but forget any new throw pillows or blankets! Yellow is a seriously hard color to complement. So when it came time to choose colors for the living room, I knew I wanted to glam things up to a 9.8. I wanted to take advantage of what is a naturally-bright room from sunshine and 10-foot ceilings. Time to go --- DARK. Also, that print above the couch? We randomly came across it while at IKEA. This print, as huge as it is, was only $50. And it came framed! I figured, even if it becomes one of those over-used IKEA prints, there is no loss, because it was only $50. We can always upgrade later. 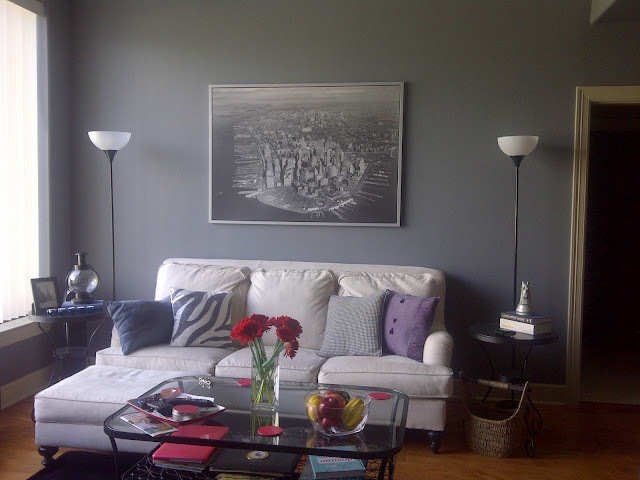 In the meantime, a shot of our ultimate favorite city is the perfect accessory in our A-town home. 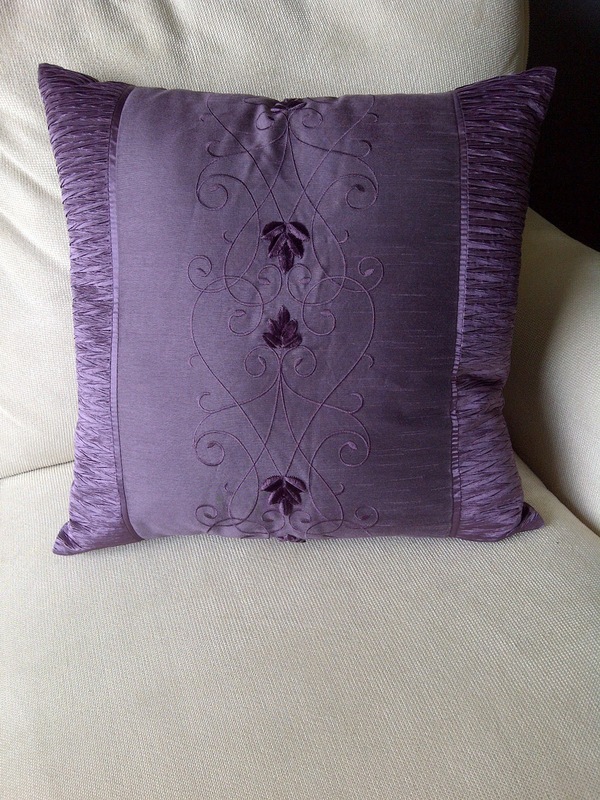 The new color on the walls meant that the couch needed some jazzing up, too. 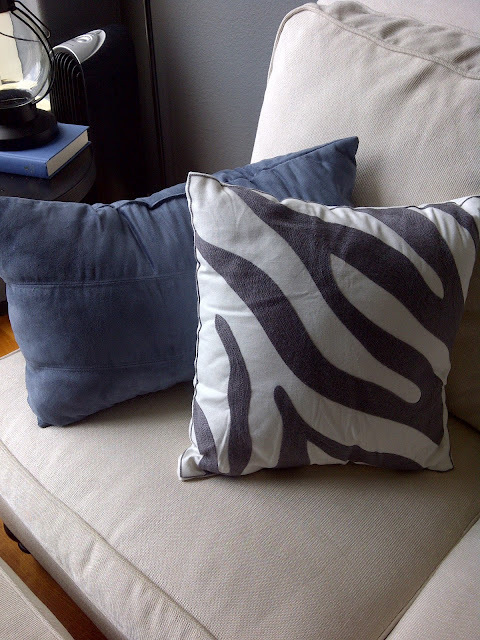 After a good steam clean, I went out and picked up some new throw pillows from Ross. My favorite is the gray zebra print one, but I honestly really love how they all go together while being so different even more. Since the room is now much darker, the evening vibe gets super chill in here. I think the late-night look is almost as cool as the daytime version! Last but not least, St. Thomas the Fish also got a little decor fix in his corner. 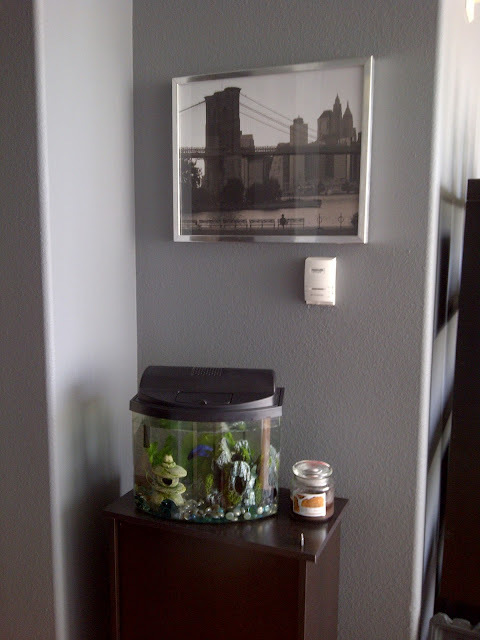 We have another IKEA print (circa 2007) hung over his tank. So, what do you think? Does the new blue-gray look high-rise appropriate?? Stay tuned for more. I have one more big post to share with you this week!